Jason Greenblatt blasts Hamas and its Iranian patrons in a series of tweets. Jason Greenblatt, President Donald Trump's Special Representative for International Negotiations, on Sunday evening blasted the Hamas terrorist group as well as Iran for sending funds to Hamas. “Hamas must also permit the repatriation of Hadar Goldin’s remains and the release of Oron Shaul, as well as the release of Israeli civilians - Avraham Abera Mengistu, Hisham al-Sayed and Juma Ibrahim Abu Ghanima,” he added. A week ago Sunday, Greenblatt toured the Israel-Gaza border area, accompanied by the IDF’s Coordinator of Government Activities in the Territories (COGAT) Major General Yoav Mordechai. 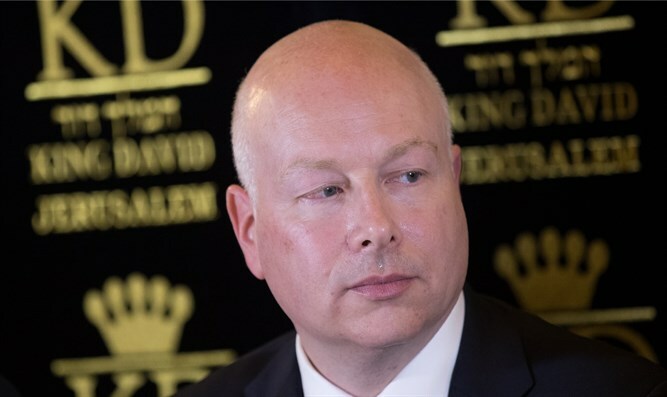 Greenblatt visited one of the recently discovered Hamas terror tunnels, which extends from Gaza into Israel, and received a comprehensive security briefing regarding the threats emanating from Gaza.